Produced by TIFF (Toronto International Film Festival), digiPlaySpace is an interactive playground for kids and grown-ups alike where they can explore new media technologies, learning-centric games and hands-on installations. Guests will engage with 14 different interactive digital activities created by artists around the world. 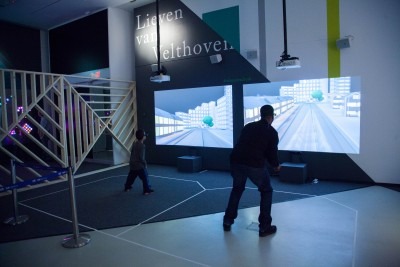 From large-scale interactive installations and fast-paced multi-player videogames, to immersive green-screen adventures and experimenting with robotics, digiPlaySpace offers guests of all ages exciting ways to explore our increasingly interconnected world. The Buffalo Museum of Science is only the third museum in the U.S. to host the exhibit. Members join us for an early sneak peek at digiPlaySpace! Friday November 17 from 5:00p - 9:00p.